Agreement includes distribution of wired and wireless microphones, headphones, commercial and consumer audio products, effective October 13, 2017. 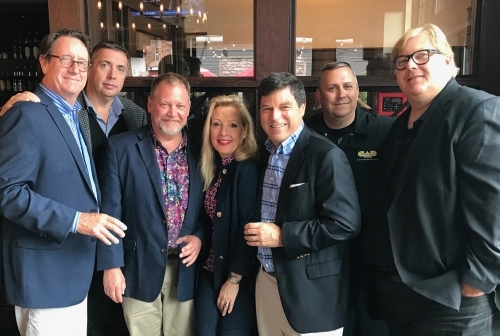 (L-R) Lynn Martin, president AM&S, Dean Downey, VP Sales Operations AM&S, Kelly Statham, VP Engineering CAD Audio, Moira Carr, director Marketing CAD Audio, Brig Carr, president CAD Audio, John Vorndran, sales manager AM&S, Glenn Roop, VP Business Development CAD Audio. American Music & Sound (AM&S) has been appointed worldwide distributor for CAD Audio, an agreement which includes the company’s expansive offering of wired and wireless microphones, headphones, commercial and consumer audio products, effective October 13, 2017. “This new relationship with CAD Audio is an exciting time for AM&S,” says Lynn Martin, president of American Music & Sound. “CAD Audio has had over 85 years of success designing and manufacturing popular and critically acclaimed live and recording microphones, headphones and related commercial audio products, which makes them an ideal fit with our other product lines.